Production ready 4 inch aperture downward looking flatness interferometer, high in features, low in cost! Tip-tilt alignment sensors allow easy adjustment of tilt fringes of the part under measurement. Optimize fringe contrast with z-position sensor and percent contrast indicator while viewing live fringes. Hand-wave no-touch sensor allows measurement without keyboard inputs; for high throughput QC of batch parts. Determine polishing process fingerprint with low-noise, sub-nanometer measurement capability. 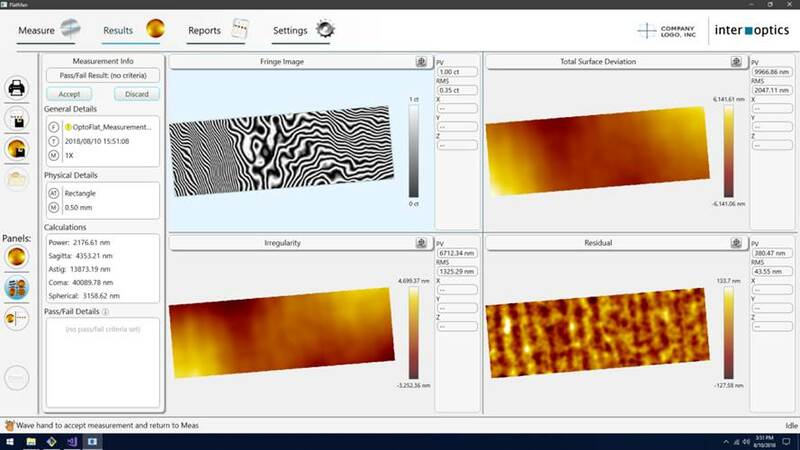 With user adjustable spatial filtering of measurement maps, InterVue software displays residual maps and profile data to view fine scratches and polishing artifacts. The low coherence interference eliminates coherent noise so surface features are reliably displayed. OptoFlat can help you develop your own fine polish process! Production ready 4 inch aperture downward looking flatness interferometer, high in features, low in cost! 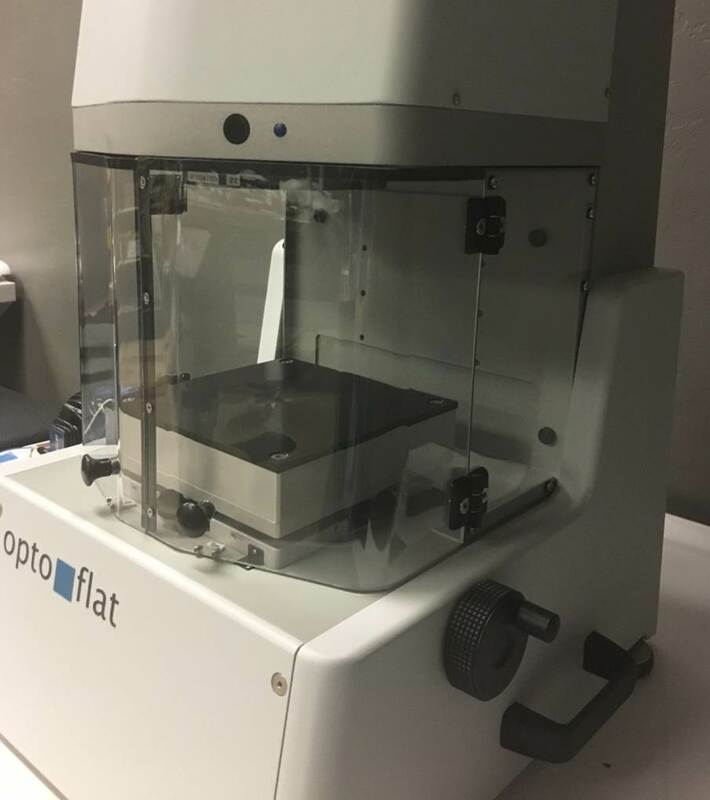 The industry unique OptoFlat is a low cost-of-ownership, turn-key system with an ultra-stable, rigid mechanical design in a small footprint. Easy loading of part on stage and "hand-wave" sensor to initiate test, OptoFlat offers quick part-to-part measurements without operator keyboard input. 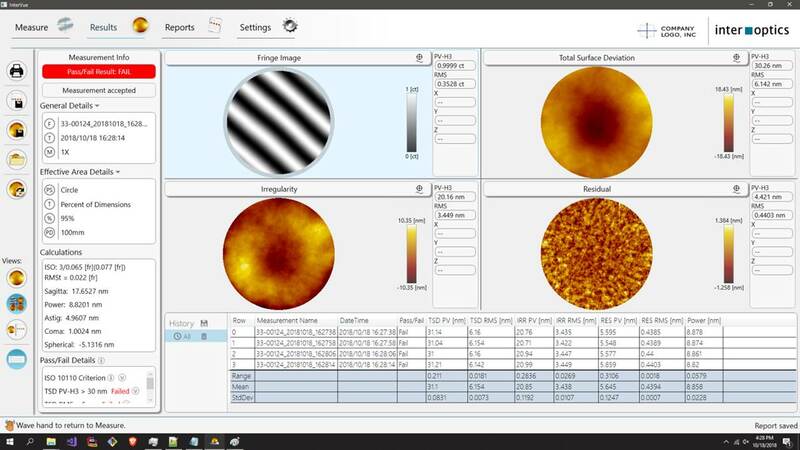 Years of experience in interferometric methods have contributed to the advanced technology and features built into OptoFlat. Learn more in our TECHNOLOGY section. 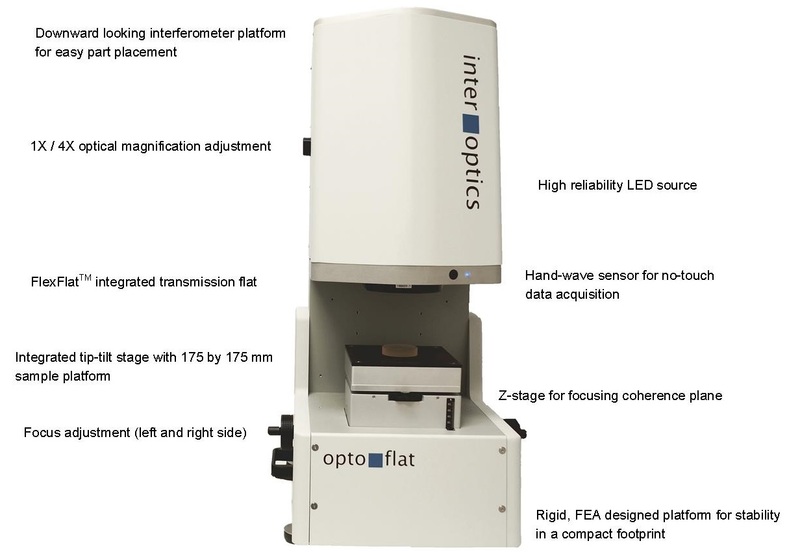 OptoFlat was designed as a low coherence interferometer to measure plane-parallel transparent polished surfaces without special treatment of the backside. Thin glass wafers and disks of 300 microns thickness or more are easily measured. Just position on the integrated stage, adjust focus position and tilt and with a wave of the hand, a measurement of flatness is performed. Sub-nanometer measurements are routine. No other interferometer in this price range can compete with the precision and capabilities for measurement of flatness and transmitted wavefront of plano optical components. Interference artifacts are suppressed or totally eliminated through the engineered coherence of the novel OptoFlat design. By using an extended source, dust, scratches and nanometer scale surface variations within the optical train do not produce artifacts in the measurement. Polish process fingerprints are clearly seen. 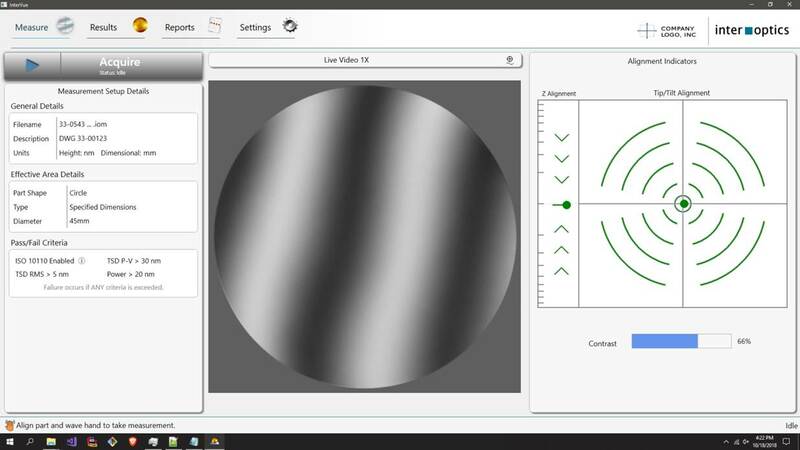 Improvements can rapidly be made to a process by using OptoFlat to monitor and document successive iterations. Main screen shows fringes, tip/tilt alignment and z-position for easy adjustment. Top surface of microscope slide. Select display of four maps: Fringes, Total Surface Deviation, Irregularity and Filtered Residual Maps. Measurement results according to ISO-10110 standards. Track statistics of multiple measurement results. Batch processing for production quality control. For turbulent lab conditions, an optional air shield reduces effects of air variations. 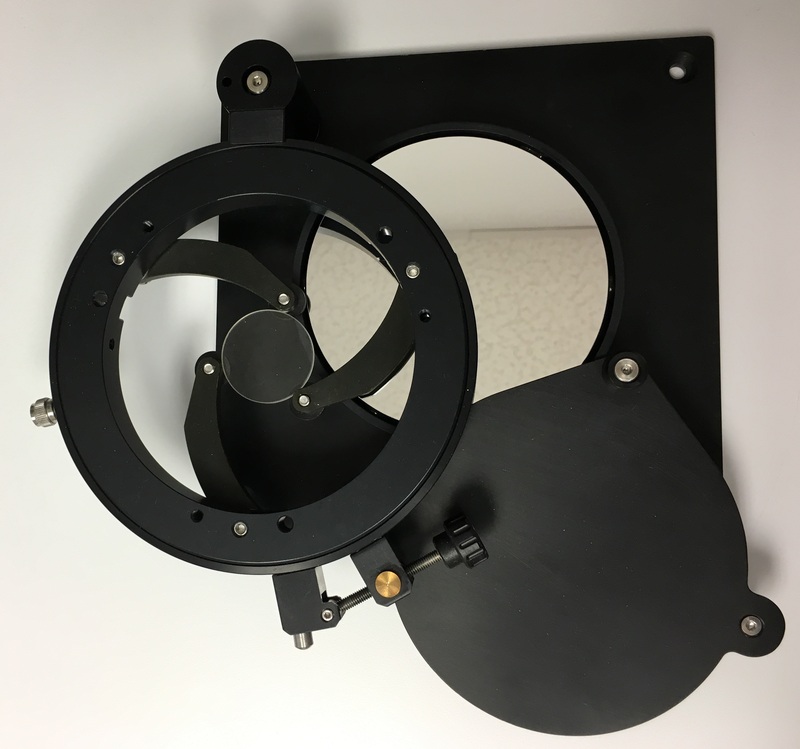 Assembly for transmitted wavefront testing includes 100 mm diameter reflection flat. Unit mounts on the OptoFlat stage and incorporates an adjustable 3-jaw holder and flip-in shield to protect the reflection flat. Applying over 30 years of experience in interferometric metrology, the engineers and scientists at InterOptics have developed the low coherence OptoFlat flatness tester, an example of InterOptics' promise to extend the state-of-the-art in high value, high precision optical metrology instrumentation.